In my downtime as a currently unemployed person, I've been taking the opportunity to catch up on some leisurely reading. One of the books I'm reading now is "David and Goliath" by journalist Malcolm Gladwell. It raises some interesting points about how people who we would normally view as "disadvantaged" can become successful because of their perceived disadvantage. Take the old Biblical story about David and Goliath. Even if you're not a Christian or a religious person in general you're probably still familiar with the story of how the small underdog (David) was able to kill the huge and powerful warrior (Goliath) with a single stone from his sling shot. However, Gladwell posits that upon closer inspection we shouldn't be so surprised that little David won the fight. In fact, when you look at how the battle went down, David should have won. Consider the following: Goliath was a huge infantryman wearing heavy armor and armed with weapons (sword, javelin, etc.) that were designed for close combat. He expected that the battle between himself and whoever the Israelites put up against him would be fought hand-to-hand up close. In that day and age, that the prevailing view on how armies could settle their battles was two-fold: either (A) the entire army could fight against the other entire army; or (B) each camp could chose their best warrior to do up close and personal hand-to-hand combat with the warrior from the other camp. But that's not exactly what Goliath got. David did not think like Goliath. In fact, David, an Israelite, did not even think like his own fellow Israelites; they offered to give David the same armor and weapons that Goliath had, but he turned them down because he was too small to be weighed by all of it. David was a small shepherd boy who could sling small stones from far distances, so that is how he approached this challenge. Any other approach to him would have seemed foreign. But because the Philistines and Israelites were used to seeing two big guys slug it out, everybody viewed David's size, lack of hand-to-hand weapons and lack of armor as major disadvantages. As it turns out, however, those three things were actually advantages in this scenario. 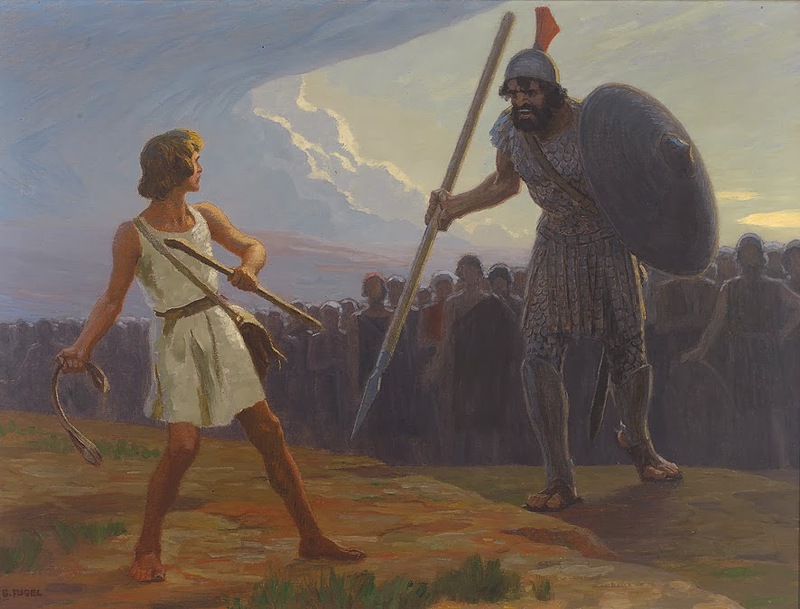 Advantage #1: Because David was small, he fought from a distance -- not up close where Goliath was expecting. Advantage #2: Because David was not relying on a sword, he used the sling shot which allowed him to hit Goliath in the head from a safe distance. Advantage #3: Because David was not carrying any heavy armor, he was able to run quickly after knocking Goliath down, pick up Goliath's sword and chop of his head all before Goliath had a chance to figure out what the heck just happened. In other words, a "disadvantage" or an "advantage" really depends on your perspective. Moreover, sometimes when life throws us a disadvantage, that disadvantage causes us to take different paths towards our goals that most other people don't have to take which, interestingly enough, can cause us to become more successful than most other people. Stated differently, when you are forced to do things the hard way then you tend to become even better at what you do than the rest of the people around you who were able to do things the easy way. In support of this proposition, Gladwell offers the fact that over a third of the most successful Fortune 500 CEO's and start-up entrepreneurs out there have dyslexia. Dyslexia is, of course, a reading disorder that makes it more difficult for people to read and write. However, what Gladwell found was that because people with dyslexia have to try even harder at every day life than those of us who don't have dsylexia, it causes them to become very successful in other critical areas that can lead to business/financial success such as listening, memorizing and thinking quickly on your feet. I'd be interested to hear what folks think about this concept. Can you recall achieving a milestone in your life that is usually difficult for others but that came easier for you because of a disadvantage that you have been forced to deal with?